Is your current work space a cubicle? 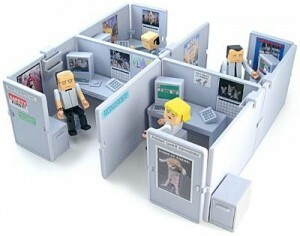 Is a move into a cubicle in your near future? Life in a cube presents certain challenges. And if you’re being moved out of an office into a cube farm, the change can be emotional, as well. Working in a cubicle does have some upsides, such as developing an open and connected staff and creating a feeling of camaraderie. However, studies show that most workers are not thrilled with the idea of working in a cube because of the lack of privacy and the increased noise. Here is a set of ground rules that will help cube dwellers remain both productive and neighborly. Never enter someone’s cubicle without permission. Behave as though cubicles have doors. Do not enter before you have eye contact “permission” from the occupant. Try not to sneak up behind someone in a cube. Announce yourself at their doorway or lightly knock on the wall. Post a sign or flag at your cube entrance to signal when you can be interrupted. Avoid making eye contact with people if you don’t want to be interrupted. Don’t “prairie-dog” over the tops of cubes or peek in as you walk past each one. Don’t loiter outside someone’s cube while you wait for him or her to finish a phone call. Come back at another time. Never read someone’s computer screen or comment on conversations you’ve overheard. Resist answering a question you overheard asked in the cube next to you! Keep your hands off a cube dweller’s desk. Just because there’s no door doesn’t mean you can help yourself to their paper clips. Try to pick up your phone after one or two rings. Set the ringer volume at a low level. Limit the use of speakerphones. If you must use one, keep the volume as low as possible. Use a meeting room for conference calls. Watch your volume when talking on the phone. A headset can help keep your voice low. When you leave your cubicle, turn your landline phone off and let it go to voicemail or forward your phone number to your new location. Never leave your cell phone behind in your cube without first turning it to vibrate or silent. With personal or sensitive calls, be aware that your neighbors can hear your end of the conversation. Don’t talk through cube walls or congregate outside someone’s cube. For impromptu meetings, go to a conference room or break room. Don’t bring clients to your cube to meet with them. Go to an office or conference room. Don’t yell across the “cube farm”. Get up and move to the other person’s location. Use email or instant messaging to communicate silently with your coworkers. Play music at low volumes or use earbuds. Set your PC volume to a low level and turn off screensaver sound effects. Work out an arrangement with your neighbors to take lunch breaks at different times. This will give each of you some quiet time in your cube. Eat quietly. Avoid gum-popping, humming, slurping and pen tapping. A good rule of thumb is to never eat hot food at your desk. Food odors can bother your hungry neighbors. Perfume and cologne should be avoided in a cubicle arrangement. Your neighbors may have allergies. Keep an air freshener handy. © 2015 The Edge Executive Coaching. All Rights Reserved.